San Diego Tourism provided me with free admission to the Birch Aquarium. All opinions are my own. No daddy that is a Coelophysis. Tis the time of year when we are all looking for gift ideas for our kids. Here are some ideas that I have found for you! This is a fantastic idea for kids in the 8 – 13 age range. You get to choose from two different mysteries, with a third option on the way. Your kids will receive a series of clues related to the mystery in the mail over a period of six weeks. Our kids are in the midst of the pirate mystery and they love it. They keep wondering when the next envelope will arrive. The first letter included a message in code and they took copies of the letter to school and a significant portion of the kids in their grade three and five classes were working hard on cracking the code and then we had half a dozen kids come home with us after school and with some efforts they broke the code and figured out the message. Full disclosure: we are receiving this mail order mystery in exchange for a review blog post. So far it is excellent and I’ll write more about it when it is wrapped up and the mystery solved. As a small business owner and maker myself, I thought I would help promote some of my fellow Etsy vendors this year. I am not being paid to promote any of these products, although if you do make a purchase through any of these links I will receive an affiliate commission. It will not impact the price of the product you purchase. Most of these will be making an appearance in our house this year. Because every kid needs to look like they are being eaten by a shark while watching TV! My eight year old in particular is regularly challenging me to a tic tac toe game – convinced that if she plays me enough times she can win, as soon as she figures out the system. This handmade travel game looks great and will cut down on the amount of pieces of paper lying around our house covered in x’s and o’s. 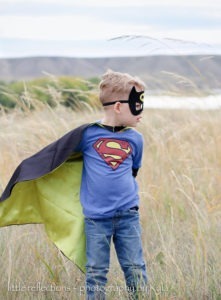 Each of my kids have been found wearing superhero capes at various times in their lives. The bonus is that these capes and masks also fit adults. There is a certain three year old in my house who will be very excited to get her own cape and mask. Sadly this one is not in my price range this year, but as a fellow woodworker I love to see what other wooden toys people are making. My kids love fairies and building with blocks, so this one is a winner for me. This one might make an appearance in our house for a birthday present later in the year. These are intended for kids and I think would be pretty great not only to get your kid talking at dinner, but also for date night if you are stuck for conversations that don’t revolve around your kids and poop. I look forward to the conversations to come! It is the unicorn of the sea! Our house is already overrun with stuffed animals so I’m not getting this one. That said – I know you want it because it is a narwhal and a very cute one at that! So Cute! A friend made my three year old a couple of hats that look like a wig. They were gifts when she was a newborn and she still regularly wears the larger one that still fits. Once she grows out of that wig/hat, I’m coming to this page to pick out a new knit hat for her because she loves her wig hat! I would be remiss if I didn’t also promote my own stuff. You can find wooden toys and decor for kids and adults alike in my Etsy shop. Check it out and help me make some sawdust! I periodically encounter people asking ‘who do you recommend for webhosting?’ A couple of years ago I switched over this blog and my woodworking business site from GoDaddy to Bluehost. At the same time I set up a couple of other sites. I didn’t have any particular issues with GoDaddy. I saw a number of other people recommend Bluehost and at the time it was going to be a better price to switch. It was easy to set up an account with Bluehost and it was relatively easy to switch over my two other sites. I say relatively because I chose not to take advantage of their paid service where they will migrate your site for you and make sure everything is set up properly. I decided to do it on my own and figure out how to do it with the help of youtube and plugins and tools and guides I found provided by Bluehost. It mostly worked out. I want to tell you about a couple of recent experiences that were fantastic. The live chat function always provides an opportunity to rate the service you received from the particular agent you talked to on a scale of 1 – 10. I typically rate at seven and up with the service I have received. In these two instances I wish the scale was bigger. Story #1: A week and a half ago I realized that this blog had been hacked and anyone attempting to visit the site from a mobile device was being redirected. Initially I had trouble connecting with someone via the live chat for tech support. This was in part due to the poor internet connection I had at the time. I did some research about fixing hacked sites and came across many services that were willing to fix the hack for me for several hundred dollars. I don’t have several hundred dollars to fix it so I was determined to find a lower cost solution. So I fixed as much as I could myself and it was still redirecting for mobile visitors. When I got home I contacted the live chat people to see if they could at least tell me what I was missing so I knew where to look to do the remaining repairs. (I am not a coder and don’t know what to look for when something goes wrong). I expected that if I asked for anything more that they would charge me for fixing the hack. The support person took a look at my site, fixed the remaining error and my site was back in business. It took less than ten minutes to resolve at no cost to me. Today I received a notice of potentially malicious code in this site and in my ThomasWoodcrafts.com site. So since I had recently been hacked, I went to work removing the malicious files. In the process I managed to break both sites. One was almost completely blank and on the other I lost all the site design and formatting. Not a great start to my day. I started trying to repair the damage myself. Then I decided to reach out to Bluehost to see if they could help me. The support person was able to restore the backup of this blog from before I broke it. Within minutes it was working again with no problems. My other site was not so simple. The restore of the backup didn’t work properly. As a result I spent a couple of hours going back and forth working with the tech support person with each of us trying different things to resolve the problem. In the end we got pretty close to what it had been. I have a bit of work to do to full restore the site to its former glory. It is much less than I would have to do if it hadn’t been for the excellent support that I received today. I believe in giving credit where it is due. Bluehost is not paying me to write this recommendation and I am not a part of any affiliate program – at least at the time of this writing. I receive no compensation if you choose to sign up with Bluehost as a result of this recommendation. I have had nothing but excellent service from Bluehost and I recommend them to anyone seeking a web host.